One of the benefits of a small business is the ability to be agile and have staff who are very committed to both their role within the organisation, but who can work together to support customer’s satisfaction. We pride ourselves on doing what we can to ensure customers enjoy their new or used campervan or motorhome. A mechanic by trade, Clayton turned a used car yard into a successful RV business after trading a campervan and spotting a gap in the market. BCMC became an agent for Frontline (Campervans) in the early nineties and to this day are the sole distributor of Frontline north of Newcastle. In the mid-nineties Clayton developed his own ‘brand’ and today that business is known as Horizon Motorhomes. 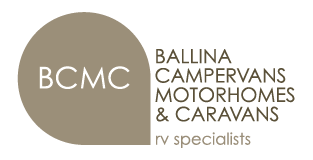 Horizon currently have a staff of 14 and a range of 8 luxury motorhomes that are designed and built in Ballina and sold exclusively through BCMC. Clayton never stops and he spends a lot of time researching current trends, attending trade shows around the world and listening to what the customer wants to ensure he delivers the best end product possible. When not at BCMC, Clayton can be found at the Horizon Motorhomes factory overseeing all operations. When he’s not working he enjoys life to the full – touring throughout Australia and testing the products makes for exciting family holidays. His other passions are motorcycling and water-skiing. Ken is a familiar face for many having been involved with BCMC and Horizon on and off since 1999. He is our Sales Manager, working closely with John and Mark. Ken’s involvement with Horizon spans 10 years and he has seen the business and the team grow substantially over that time. New Zealand born, Ken has been living in Australia for over 25 years and has travelled the country in a range of recreational vehicles including a Toyota Hiace Frontline Camper and a Horizon Motorhome. Like most of the team, he has tried and tested the Horizon range and fully believes in the quality of our product. When not at work you can find Ken running, keeping in shape at the gym or falling off his goat boat!! John joined the BCMC team with more than 25 years of service and sales experience under his belt. Originally from Bowral, John moved to Ballina in the year 2000 where he met his wife and they have settled with their two children and the dog. He prides himself on helping people get the most out of their lifestyle, and offering products that suit the individual lifestyles and needs of our customers. He is passionate about the products that BCMC offer and loves seeing the pleasure on a client’s face as they drive out of the showroom in their new home away from home. In his spare time, you can find John watching or participating in sports. His other passions are social poker, fishing, relaxing and meeting up with friends and family. He also loves travelling around Australia – “it’s one of the best backyards in the world – you won’t find better anywhere else”. Jack joined the company with 28 years of sales experience in 2006. He has built his success on ensuring he is matching his clients’ needs to the best products for their situation. Working with his clients to achieve this level of satisfaction is paramount in his approach to sales. Jack is married with two grown children. His hobbies include regular games of tennis and golf, enjoying music and entertaining friends. He travels Australia and overseas as much as time allows. He is very involved with the local community schools and church. His garden takes up any spare time left. Although Jack has ‘officially’ retired after nearly a decade with us we’re not letting him get away that easily – you can still expect to see him around the BCMC showroom and at shows, as he covers holidays and busy periods. Sharon is usually the first person you meet either in the showroom or on the phone. She supports the Sales Team in sales administration and customer service. Sharon handles the admin side of the sales process, orders all of the vehicles, handles their registration as well as, updates the websites with stock. Sharon lives here in Ballina. She enjoys all kinds of music, which is usually influenced by her 2 teenage daughters. On weekends, Sharon likes to get out and about in her Frontline Volkswagen Campervan. Sharon is obsessed with the ocean and everything in it and can’t wait to explore the Great Barrier Reef. Greg is the Service & Warranty Manager at BCMC and joined the team in November of 2015. Part of Greg’s role is responsibility for BCMC’s Annual RV ‘Check-Up’ programme, which provides a health check for all key aspects of Horizon Motorhomes and Frontline Campervans including testing house batteries, battery chargers, checking and replacing water filters and testing all electrics and adjusting cupboard door and drawers. Originally an auto electrician by trade, Greg moved into the RV industry and has now over 15 years experience as a workshop manager, supervisor and in the service and warranty department. Greg brings a wealth of knowledge and experience to BCMC, from his work experience and as an avid caravanner and grey nomad himself, he can relate to customers needs and wants, and gets enjoyment out of fulfilling their needs. He loves resolving issues and problems and making sure customers are fulfilled with their whole experience. Greg recently moved from the Sunshine Coast to Tumbulgum to be closer to his family. He is married with two grown up children and twin granddaughters. When not at BCMC, you’ll find the Wilkins family getting away in their caravan, camping, fishing and waterskiing. They’re a sporty bunch! Daniel aka ‘Macca’ joined the Service and Warranty team at BCMC in 2012 and has more than 10 years experience servicing motorhomes and campervans. Macca is passionate about his job as a motorhome technician and loves working with the BCMC/Horizon team. He prides himself on servicing and maintenance of motorhomes and getting them back on the road. He loves seeing client’s happy as they leave the showroom in their motorhomes. Macca is a local to the Ballina area, living here with his wife and two kids. In his spare time, you can find him with his family in the water close to home – either fishing and/or at the beach. As well, when opportunity strikes they love to go overseas recently going to Bali and Thailand and/or camping with his family. Zach has been a Motorhome Technician with BCMC for 5 years. He has over 10 years experience in car detailing and 4 years as a welder. As part of the team, he ensures that all the vehicles are detailed to perfection and ready to go before delivery to their new owners. He enjoys working with a great company that delivers a fantastic product. Zach is a local Northern Rivers boy and has lived in Ballina for well over 15 years. He has a small family and lives the coastal life to the fullest with surfing, golfing and spending time with friends. Cody is another one of our Motorhome Technicians, joining the BCMC team in July 2016. He is responsible for detailing all our campervans and motorhomes prior to customer collection. Cody is enjoying learning all about our Frontline and Horizon vehicles and enjoys being part of the BCMC team. Some of Cody’s favourite camping memories are from his time spent camping locally at Lennox Head each Christmas. When not at work, music lover, Cody enjoys going out with friends and attending music festivals and concerts.